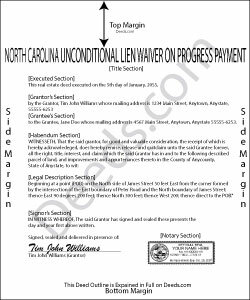 An unconditional waiver upon progress payment releases all claimant rights through a specific date unconditionally (meaning that the release of rights is not dependent upon the payment clearing the bank). Because this is an unconditional waiver, only use it after a progress payment has actually been made and received. Getting a lien waiver also allows property owners to shield the title to their property from the general contractor, material suppliers and subcontractors involved with a project. With a partial lien release upon a progress payment, the property owner works toward regaining clear title and the ability to obtain financing or sell the property.